Do you love the sunsets over Charlotte Harbor? Can’t get enough dolphins? Visiting and want to try a variety of cruises? The cost of the pass is only $189 + tax for adults or $94.50 + tax for children (3-11 years old). 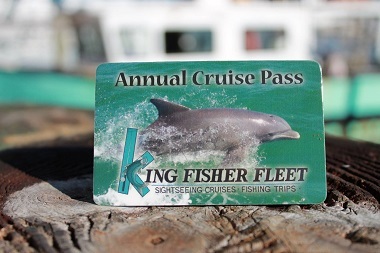 To purchase, visit the King Fisher Fleet ticket booth at Fishermen’s Village or call (941) 639-0969. Bonus: Show your Annual Pass to your server at The Village Fish Market restaurant, also located in Fishermen’s Village, and receive your choice of a) a free cup of chowder with purchase of an entree from the regular menu or b) a dessert for $2 when purchasing an entree ($3 for chocolate creation). Child’s annual pass entitles the child to a free ice cream dessert when ordering off the kids menu. (If ordering an entree off the regular menu then the same offer as the adults.) Not to be combined with any other offer.